For some reason, this book made me think of the Uglies series from the very beginning, which is a good thing. I really adore that series and luckily that vibe was through out Possession and made me enjoy the story more. Vi's voice was very appealing. She was funny and smart. She also didn't give up easily. I love Jag . He is kickass and totally swoon worthy. He was so charming. Their chemistry was so awesome and I felt sorry for Zenn, because he was definitely not on Vi's mind now. The plot was confusing at times and I wish that more was explained about the dystopian world in the story. There were several questions that I had that were never answered and hopefully that will happen in a sequel. Luckily the mystery of the story kept me entertained every single moment and made me want more. Johnson's writing was amazing. She made interesting characters, a mysterious and thrilling plot, and a dystopian world that kept me excited. I can't wait to see what she will come up with next and I really hope that it is a sequel after the evil ending that made me want a lot more from Elana Johnson like now. I'll pass. I'm not big on dystopian, but especially not dystopian that doesn't spend time on the worldbuilding. 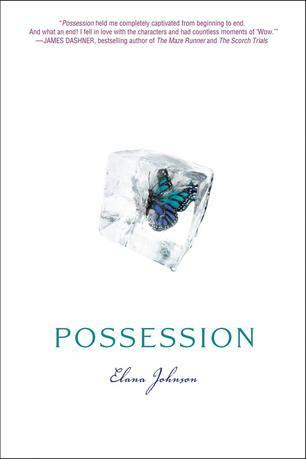 I actually reviewed Possession on my blog today too! I also felt sorry for Zenn--I wish we got to know more of their back story though. I completely agree with you about the ending too; it made me want the next book now! I'm not sure how I feel about Jag yet.